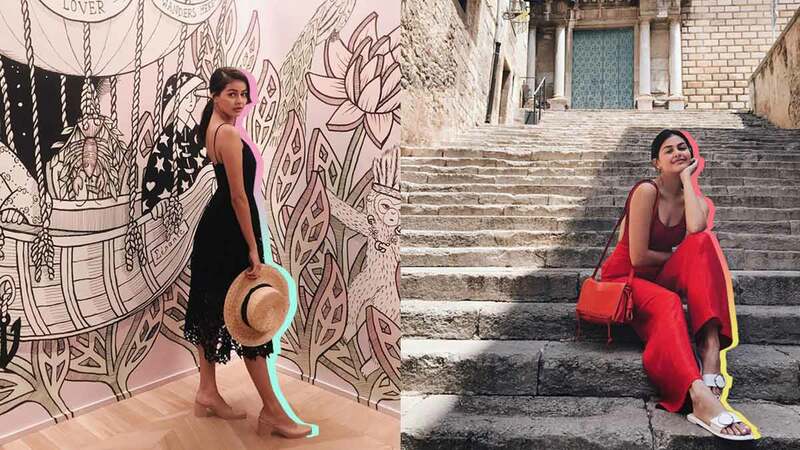 We’re used to seeing Janine Gutierrez always dressed to impress on Insta, so it was no surprise to see killer OOTDs from her recent trip to Europe. Hopping from one country to another in classic styles, she made simple and effortless look like a thousand bucks. Here's proof. Looking effortlessly hot in Girona, Spain, Janine paired a red backless onesie with red wide-leg trousers and a sling bag. She then finished it off with a laid-back pair of white slides. Janine kept it casual in Barcelona by wearing a printed dress and denim jacket matched with a pair of ankle booties and high socks. She’s got that red lip, classic thing that we like. She also served some Vania Romoff realness in a simple navy floor-length frock. That back, though! She then opted to wear a fresh white-on-white ensemble for an Italian Riviera day. For a visit to the Gucci museum, Janine kept it Euro-classy in a mid-length lace dress with a straw boater hat and mules. For a day of walking around beautiful Florence, Janine kept it real and went for sneakers! When in Switzerland, a hike is a must. She opted for athleisure and traded the trainers for a pair of hiking boots. She knows it couldn't get any classier than a basic tank-and-blue-jeans combo. The LV sling is just an added bonus.